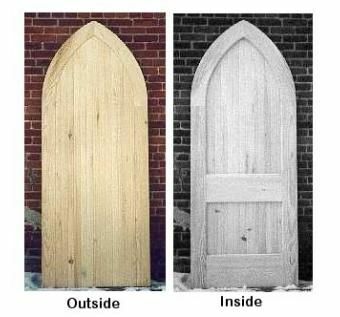 These Traditional Gothic Doors are of an interesting construction. You may notice on the inside view to the right you can see the middle & bottom horizontal rail, but on the outside view you cannot see these members. This is because only the Gothic styles are 1-3/4" thick. The horizontal middle and bottom rail are only 1" thick allowing the T&G vertical cladding to layer completely over these frame members on the exterior side of the door. This allows weather to shed off the door like water off a ducks back. Great traditional design! Dimensions: Made to order any size & Shape. Price will vary depending on size and material chosen.